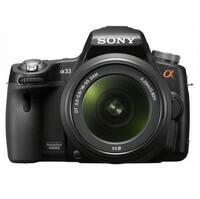 Released on August 2010 the Sony Alpha SLT-A33 is the next in line from the Sony's alpha family of interchangeable lens cameras. In this report we note the big hardware innovations that Sony has released with the A-33 and look at how they fared on the field as some of the experts test out the A33. We look at 24 different reviews from digital camera experts including some of the most prominent ones like Imaging Resource, CNet, PC Mag and the famed DP Review, and then summarize their buying advice on the Alpha A33. It should be noted that the A-33 is the cheaper cousin of the A-55, the difference being primarily that the A-33 has a smaller resolution CMOS sensor and also a slightly reduced continuous burst shooting rates. The A-33 is the first camera from the Sony stable to employ what Sony calls the 'Translucent Mirror Technology'. The Translucent Mirror Technology enables a fast and accurate phase detect auto-focus by splitting the optical pathway between the main image sensor and a separate phase-detection auto-focus sensor. The primary advantage of the Translucent Mirror Technology is a high-resolution live image preview with a fast and accurate phase detect autofocus available at all times through the LCD or the electronic view finder. The A-33 also supports a large size Exmor APS HD CMOS sensor which should aide in much better HD video footage. SteadyShot in-body image stabilisation system. Multi-frame Noise Reduction which combines six high burst frames to create a dramatically reduced noise exposure to increase effective ISO levels to as high as 25600. Image quality and color accuracy seems to stand out for the A-33 across the board. Every expert supports the claim, including DP Review, Imaging Resource, PC Mag and PC World. DP Review also finds it decently good at lower ISO levels however they find some loss of detail over ISO 400 in JPEG mode. The image stabilization is also very effective and earns high praise from the reviewers at Neo Camera. Almost all experts have lauded the excellent shooting speed of the A-33. Even though they do point out that this is not the best money can buy, but at this price point this is the best in the market. The HD quality is also pretty good according to most reviewers, however PC Mag does report a quirk that the video capture often comes in with some audible lens noise. The Autofocus is the biggest highlight of the A-33. According to most experts the speed and accuracy of the autofocus is simply unmatched in the market today. The high speed autofocus is complemented by what experts found to be a very good electronic view finder - however there was some cribbing about the lack of an optical view finder. The A-33 comes in a solid build, with great ergonomics and handling according to most experts. CNet though did note a minor quibble and claimed the A-33 to be too small to hold comfortably. Most reviewers very happy with the user friendly and easy controls and found the swivel LCD to be extremely sharp. Even though the LCD received high praise from all quarters, the reviewers at About.com complained about some glare in decent sunlight. We were not able to get a lot of opinions as far as the battery life is concerned, barring CNet, who were not too happy with it. However, as most other reviewer didn't complain too much, this is most likely a minor issue. The Sony's Translucent Mirror Technology enabled Quick AF system delivers good on its promise and comes out, according to experts, a never before seen speed and an extremely accurate autofocus. The Exmor APS HD CMOS sensor also does it bit and has the experts raving about the superior video quality. The Sony Alpha A-33 is the complete package combining excellent images great video and ease to use in an extremely compact package. The only thing which might tick you off is the lack of an optical view finder. The Sony Alpha A-33 is a very good bet for the entry-to-enthusiast crowd who want the latest features in a compact package. Even though the HD movie footage is top notch and the autofocus great for fast moving scenes, it should be noted that this is not really a replacement for your pro-level sports DSLRs. Additionally, the typical point-and-shoot upgraders would do well to check out the The Sony Nex-5 which might offer a good enough deal (albeit lacking the autofocussing goodness) in a much cheaper package.